In the early 1930s, an actress named Mrs. A. J. Smith opened a pay lending library upstairs in Mouat’s Store. This little library was open several days a week and provided its services at minimal cost. Later, a group of islanders organised a book-lending facility that circulated a collection of books among its members. One of the first books from this collection is in the Salt Spring Archives, which are located in the present library building. The start of today’s library began when a group of Salt Spring women met in March 1958 to discuss the formation of a library as a centennial project, celebrating the formation of the colony of British Columbia in 1858. The project was joined with another popular project, the creation of a museum for the island. Eventually, the museum project suffered a series of setbacks and was cancelled. However, a determined group of women, led by Mrs. Stan Hawkins, worked on the library plan and twenty months later the library had its official grand opening with the Superintendent of the B.C. Library Commission in attendance. The new library was located in a back room of Mouat’s Store. It opened in November 1959 with 1300 books and a war chest of $7.68. 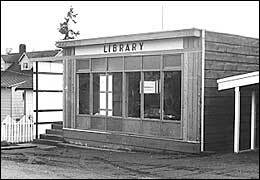 In a public meeting in 1960, the Centennial Committee voted to hand over the remainder of the Centennial Fund, a sum of $1103, to the newly created Salt Spring Island Public Library Association, which was incorporated under the Library Act of B.C. on February 22nd of that year. By 1963, the library had acquired 5000 books and had an annual circulation of 7000. This success meant that the library had to find more space. An affordable site was found on McPhillips Avenue, where the Association purchased the property and boat-building workshop of Mr. Charles Leggatt for $2300. After renovation, Mrs. W.A.C. Bennett officially opened the new library in February 1964. The library has been on this site to the present day. Several years later the library doubled in size, purchasing an adjoining property and joining a small house on the property to the existing structure. At this time, it became the only library in B.C. with a bathtub! Further renovations increased the library’s size to 506 square metres (but removed the bathtub). In 1974, the Library became known as the Mary Hawkins Memorial Library, after the passing of Mary Hawkins, who was the Secretary-Treasurer of the first Board. In anticipation of the construction of the new library building, the new building became the Salt Spring Island Public Library in 2011. In September 2009, after many years of planning by the Library Board and volunteers, the Library received a Federal-Provincial infrastructure grant of $4.55 million to construct a new library building. In December 2009, Salt Spring Island voters passed a referendum for $2.75 million for library construction. The Salt Spring Island Public Library moved to a temporary facility at 118 Jackson Avenue in July, 2011, and operated out of portables while the new library was built. The new library building was completed and opened Dec. 20th, 2012. The library has been staffed by a growing number of volunteers over the years. In the early years, a staff of two, manning the “in” desk and the “out” desk, handled the day-to-day operations. A time came when more help was needed, and a “third person” was added, this staff person became the supervisor, giving new memberships, handling interlibrary loans, dealing with any problems, etc. We now have 170 volunteers performing many services for our library. Read more about them on the Volunteers page. In October, 2004, the first paid librarian was hired to work part-time with the volunteers. In 2008 a second part-time librarian was hired. In 2012, the two Librarians began working full-time and an administrative assistant was hired to assist with management of the new building. Thanks to Grace Byrne for researching and writing this history.